After last night’s great stop, S3200, where we found a very variable selection of Ariocarpus (A. confusus), we had high hopes to continue the theme with another stop at a location where these Ariocarpus had been reported from, near La Escondida (S3201). Here the range of flower colours had been reported to include yellow and yellow-with-pink-tips to the petals. We had no problem finding the hillside, right along the side of MEX 61, but failed to find ANY Ariocarpus at all on hill, and the one behind it and the hills to the left and the right of our target location, which in itself seems a bit odd as just about every hillside here seems to support Ariocarpus plants – still, never mind! 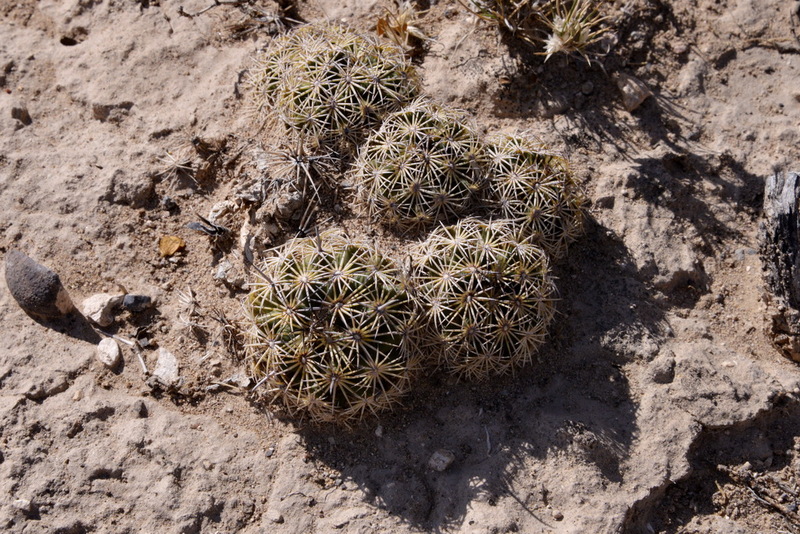 There were many Echinocactus platyacanthus here and many of these had been badly damaged, some by animals (Donkeys? Goats? Cattle?) while others looked to be damaged by disease. Could such a disease have whiped out the Ariocarpus here? There were still plenty of other cacti to see, with of course Opuntia and Cylindropuntia as always omnipresent in large numbers. I was quite excited to find a small cactus where the stem was very thin just above the ground, broadening to a normal globular plant. Might this be ‘Gymnocactus subterraneae’? Pictures were taken, just in case. Moving on, I then found similar plants, but larger, resembling Neolloydia conoidea, so that my small plant was probably nothing more than a juvenile plant of this taxon. It does seem that Neolloydia are much more variable than I had appreciated – something to look into back home on cold winter evenings. Just as at S3200 yesterday, there was a large presence of Thelocactus connoideus around. If I’m ever back here in spring, they’d be worth a stop when in flower. And to cheer Alain up, there were some more ‘Red Devils’ (Ferocactus pilosus) hiding among the shrubbery, even though the plants were up to 2 m tall. Time to move on and as we approached the turning to Sandia and La Solidad that we had missed last time that we drove by here, the walkie talkie crackled and Ian offered to take us to the site that they had found on that occasion, where large Thelocacti grew (S3202). T. conothelos subsp argenteus has been reported from here and pictures in John Pilbeam’s Thelocactus book seem to match what we saw. 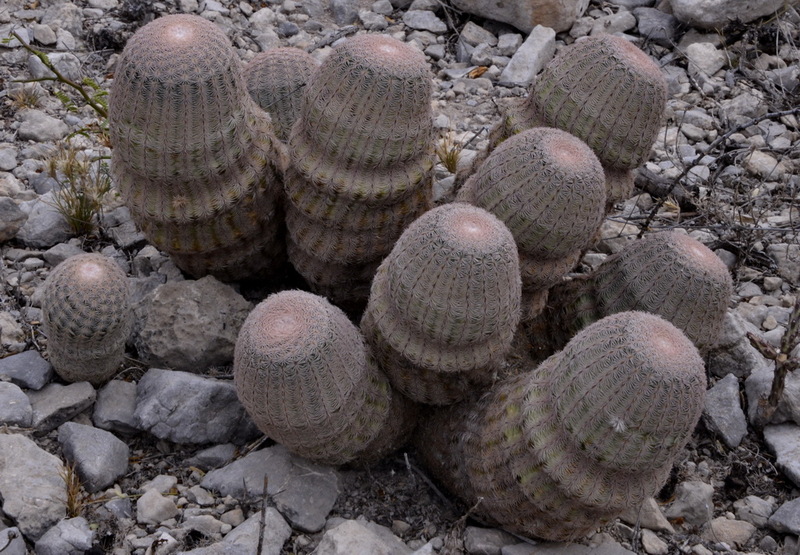 Others used to name T. macdowellii, but this plant is reported from farther north, near Monterrey, and the one large plant that I have owned and killed under that name had finer supination and formed a clump while the plants that I saw here were all large solitary heads, with one offsetting exception. More things to look up! For completeness sake I should mention Mammillaria formosa and Echinocereus enneacanthus, plants often found at our stops but not always mentioned. Another Echinocereus here was what I’ll call E. pectinatus with beautiful fine spination. Talking of things I need to look up: how can I tell E. pectinatus from E. riggidissimus from E. reichenbachii in habitat? Geographical taxonomy? We had deicided to take the ‘back road’ from Dr. Arroyo to Tula, as Ian’s map described it as a ‘big yellow’ road, but turned out to be a variable dirt track which did not help my back at all – yep, the disc popped again. The last two stops were therefore ‘leg stretch’ stops with nothing new seen. Today confirmed my opinion from 2011 that Zacatecas was a fairly boring flat part of Mexico with few plants to enthuse a cactophile, with perhaps, as an exception, Stenocactus multicostatus, which as Echinocactus zacatecensis as a synonym, used to regularly pop up in cactus quizes as the cactus taxon with the longest binomial name. Even if contestants knew the answer, few were willing to risk its pronounciation, but is that a good reason for dropping the name? I believe that all of us were quite pleased to leave the roadside ‘hotel & restaurant’ behind us. What seemed a reasonable place to pull into as we passed it late at night (i.e. after sunset) seemed preferable to driving into an unknown town where, based on our sight of the huge open cast mine during the previous afternoon brought back memories of Chile where occasionally we would find mining towns with no accommodation available with all rooms pre-booked by the local mines, whether they were occupied or not. The Friday of a public holiday weekend, Dia de Muertas – Halloween in the UK or as the religious holiday of Todos Santos – All Saints Day in the UK. The wifi signal in the hotel was not strong enough to stream data through to Google Earth to check my data to see what cacti might be found here, so we headed south along MEX 54 towards the State capital, Zacatecas. At San Burcio we turned east onto MEX 62 and soon decided to make a comfort call at S3196 or had it been planned? Back home, writing up my notes after the trip, I see that this stop coincides with the only cactus data for the area with Ariocarpus retusus and Lophophora williamsii reported from 400 m. away (and probably found here by Ian who, with greater fitness that reflects his younger years, covers more distance than ‘the old gits’) – the reported plants were just 400 m away on the same hillside. On the plus side, as I tend to record any cactus taxon found at a stop, we were able to add many more taxa to this area, even if their name for now might just be limited to ‘sp.’ But the long long stretches of dead straight roads were for me the most memorable feature here. Ferocactus pilosus, three different Opuntia, including O. microdasys, two Coryphantha including C. pseudoechinus, two Mammillaria, including M. formosa, and Cylindropuntia imbricata as well as Agave, Yucca and Tradescantia sp., indicating that there is often more to an area, cactus-wise, than the database suggests. We crossed the border from Zacatecas into San Luis Potosi where we stopped to add Lophophora williamsii to the list of plants photographed at S3197 and, closer to Matehuala, at S3198 it was a similar list again. No, I had not forgotten about today! Some days we either have no time to put pen to paper (i.e. fingers to the keyboard) while on days like today, the rumoured wifi is just not up to the task of writing and publishing the blog. Tonight was such a night, so I’m writing this missive sitting in front of the telly in the comfort of my living room in cold(ish) wet and dark England, from memory, which my friends and travel companions frequently remind me is not as good as it used to be, Fortunately I can’t remember how good my memory might have been or when. That’s life! So today’s notes are prepared by using the 133 images taken at seven brief stops as we took a look at for us unknown territory as we entered the Mexican State of Zacatecas. 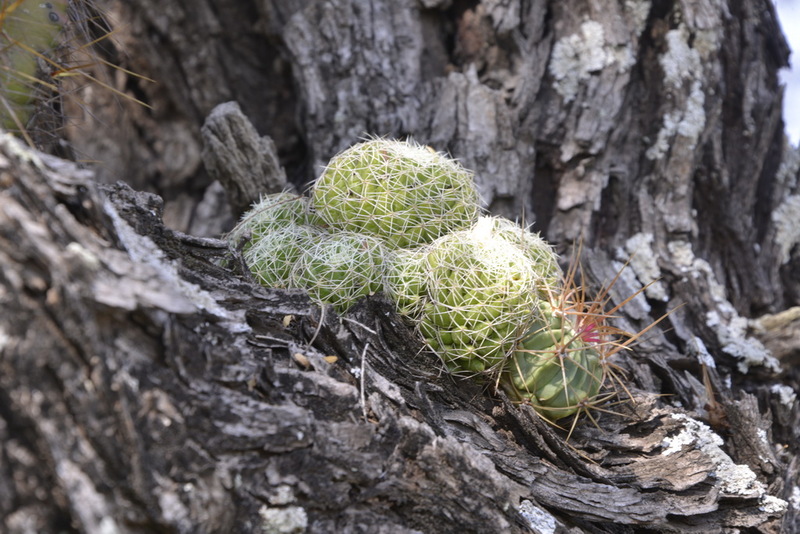 There was not much I knew about this state, apart that a cactus named after this State used to feature in in C&S quizzes as the cactus taxon with the longest binomial name: Echinofossulocactus zacatecasensis, before it was re-classified as a Stenocactus. Many quiz masters must have heaved a sigh of relief. I wonder what the longest binomial cactus name is today, and for how long. Why are we here? At Ian’s request, to try and see an ‘Echinomastus’ species so probably a Sclerocactus these days. Trouble was that he could not remember the plant’s name, did not know what it looked like, except that it had beautiful central spines and did not know exactly where it grew, other than ‘on flat lands around Cedros in the State of Zacatecas. Did we find it? May be. I spotted a plant that I could not ID, called over my fellow experts and had no choice but accept the general opinion that my plant was ‘just’ a Coryphantha species. 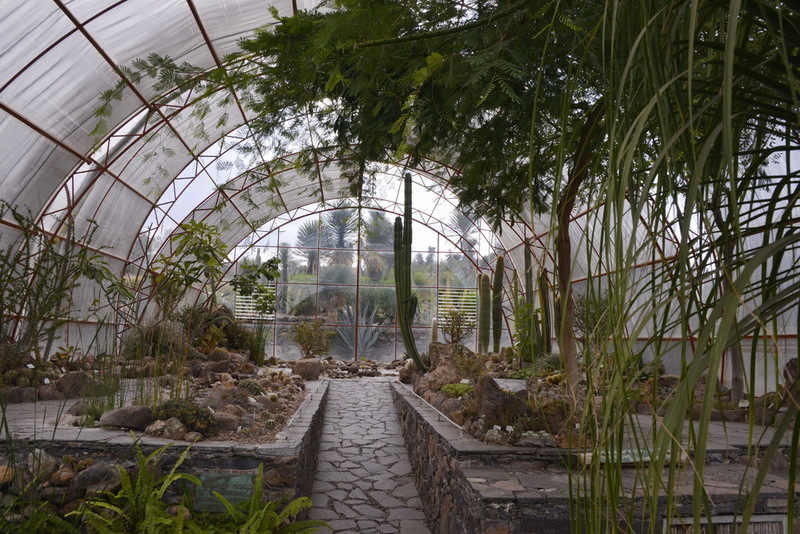 Since then I discovered a website dedicated to the genus Echinomastus and found the Echinomastus gallery run by Christophe Ludwig from Soufflenheim, France that contains a large number of pictures of images of grafted pot grown plants, raised from ex-habitat material. Some of these look as though their names could be candidates for the plant I saw. Then again, it could just be it is ‘just’ a Coryphantha. Judge for yourself: Christophe’s website is at http://cludwigfr.dyndns.org/gallery.asp?d=%5CEchinomastus&p= and the plant that I photographed in a large flat area near Cedros, Zacatecas is shown below. So what about the other six stops? S3191 near Bonanza, where we hummed and whistled the theme tune of the Western series from the 1960s and saw the same plants again, plus Opuntia microdasys plus Stenocactus sp. S3192 near Matamoros with Cylindropuntia sp,, Opuntia sp., Echinocereus enneacanthus, huge Ferocactus pilosus, and where Cliff managed to get an Acacia spine stuck in one of the tyres. A Vulka was soon found and when the thorn was pulled out of the tyre, it soon took on the flat appearance that required some patching up. The problem was quickly fixed and with the trip now over, I can reveal that this was the only puncture between our two cars during the 5319 km that our car covered, with the other car doing a bit less, as the occupants had to return three days earlier. Not bad compared to the number of punctures reported by others! S3194 was for a snake that those in the lead car saw being run down by an oncoming motorbike. The snake was taking a breather and seemed just dazed. We were not risking getting too close, just in case it wanted to take revenge. S3195 was near Mazapil, off the Concepcion Del Oro to Tecoclotes road. SatNav was very confused here as it seems that all roads had been altered here recently when gold was found here. The controversial development by a Canadian Mining company sees them accused of exploitation of the poor local farmers. It seems that they are prepared for tempers to flare up as there were armed guards all round the long perimeter. We stayed in a truck stop hotel restaurant on the MEX54. At least the restaurant claimed to have wifi.